Rep. Elijah Cummins also raised questions about other former White House aides using personal e-mail to discuss a proposal to transfer nuclear power technology to Saudi Arabia. Ivanka Trump, the president's daughter and a powerful White House aide, did not preserve all of her official emails as required by federal law, and her husband, Jared Kushner, used a messaging application to conduct U.S. business outside government channels, the chairman of the House Oversight and Reform Committee said on Thursday. Rep. Elijah Cummings, D-Md., said in a letter to the White House that the use of private email accounts and the messaging application WhatsApp by senior administration officials raises "security and federal records concerns." Cummings said that Trump's lawyer, Abbe Lowell, told the committee that Trump doesn't preserve official emails she receives in her personal account if she doesn't respond to them. Cummings says that appears to violate the Presidential Records Act. But just hours later, Lowell issued a letter of his own disputing Cummings' characterization. Lowell said he was referring to Trump's email use before September 2017 and that he told committee staff that now "she always forwards official business to her White House account." The dispute arose as Cummings also released information about Kushner's use of WhatsApp and raised questions about personal email accounts used by other former senior White House aides to discuss a proposal to transfer U.S. nuclear power technology to Saudi Arabia. Cummings' letter says Lowell told his staff that Kushner uses WhatsApp to conduct official U.S. government business including by communicating with "people outside the United States." When asked whether Kushner had ever used WhatsApp to discuss classified information, Cummings said Lowell responded, "That's above my pay grade," and referred questions to the White House and the National Security Council, according to Cummings' letter. Lowell said Kushner archives the messages he sends by taking screenshots of them and forwarding that record to his official White House email account or the National Security Council. In his response letter Thursday, Lowell stressed that he didn't say whether Kushner used WhatsApp to communicate with foreign leaders or officials. He said he also informed the committee that Kushner complies with all protocols involving classified information. CNN reported last year that Kushner was communicating with Saudi Crown Prince Mohammed bin Salman using WhatsApp. In a statement Thursday, White House deputy press secretary Steven Groves said the White House will review Cummings' letter and "provide a reasonable response in due course." The House committee's investigation comes after Ivanka Trump last year dismissed any comparison to the use of private email by former Secretary of State Hillary Clinton, which prompted an FBI investigation and inspired the "Lock Her Up" chant at then-presidential candidate Donald Trump's campaign rallies. 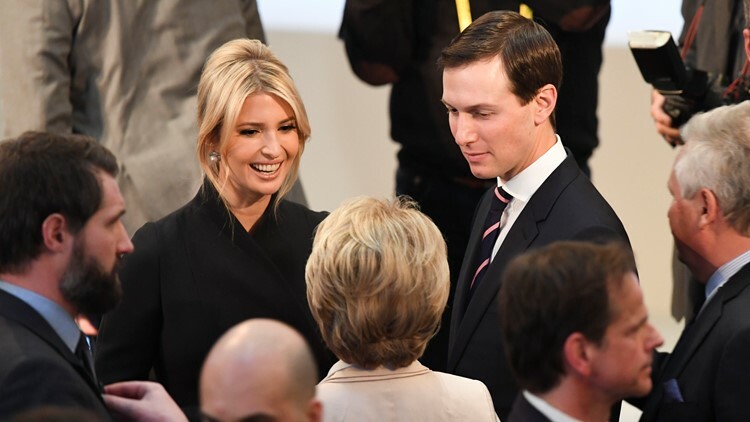 Ivanka Trump, center left, the daughter of President Donald Trump and White House Senior Adviser Jared Kushner, center right, talk with German Defense Minister Ursula von der Leyen, center, at the Munich Security Conference in Munich, Germany, Saturday, Feb. 16, 2019. While the top U.S. diplomat, Clinton sent thousands of emails using a private server set up at her home in Chappaqua, New York. The FBI found classified information in some of the emails that were sent or received on the nongovernment system, but federal authorities declined to pursue charges against Clinton. Last year, The Washington Post reported that Ivanka Trump sent hundreds of emails about government business from a personal email account to White House aides, Cabinet members and her assistant. The newspaper said many of those communications, during the early months of the administration, violated federal public records rules. In a previous written statement, Lowell spokesman Peter Mirijanian has acknowledged that Ivanka Trump used private email while transitioning to a position in the White House but said that the emails were retained "in conformity with records preservation laws and rules." He also noted that "there was never classified information transmitted" using her private email account. In an interview with ABC News last year, Ivanka Trump defended her use of a private email account, saying: "All of my emails are stored and preserved. There were no deletions." In his letter, Cummings also singled out former White House chief strategist Steve Bannon and former deputy national security adviser K.T. McFarland, questioning whether they preserved documents related to a proposal to transfer nuclear power technology to Saudi Arabia. That proposal is under investigation by Cummings' committee, which is looking into information from whistleblowers who have said they witnessed "abnormal acts" within the Trump National Security Council involving senior White House officials who were pushing the plan. The committee found that McFarland used an AOL account to discuss the effort pushed by Trump friend Tom Barrack. It cites a Feb. 6, 2017, email between McFarland and former national security adviser Michael Flynn. Bannon also received a Jan. 29, 2017, email from Barrack that Cummings said was a pitch of the plan sent to inform "Bannon's official work relating to developing 'broader Middle East policy.'" Cummings is asking the White House whether these communications were properly preserved. A representative for Bannon did not immediately respond to a request for comment. Associated Press writers Eric Tucker and Zeke Miller contributed to this report.